Precision rubber moulding specialist, Metflex Ltd has invested over £35,000 in a new 400Te press for the production of large mouldings at its Great Harwood manufacturing facility in Lancashire, UK. The investment follows a significant increase in offshore and subsea business, and the development of the MetflexSubsea NRX range of high performance rubber grades for the oil and gas sector. Metflex manufactures API 17 compliant, large rubber blocks, piggyback pipeline blocks, and rubber springs for use in riser and umbilical connection systems. For subsea applications where greater stiffness is needed, the company is able to supply mouldings containing single and multiple metal inserts. The new press will allow production of rubber mouldings up to 2,000mm in length, 450mm wide and a depth of 300mm, significantly expanding the scope for Metflex to supply new NRX rubber engineered products offshore. MetflexSubsea is the family branding for all Metflex products and services for the subsea sector. 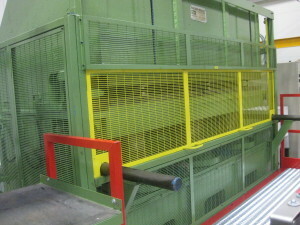 Metflex is an established supplier to the offshore industry, and has over 70 years’ experience in rubber moulding. It manufactures precision rubber moulded components, rubber seals and gaskets, and diaphragms to a worldwide customer base. Metflex offers a complete design service, and innovative production methods including rubber to metal bonding, and ultra-thin (0.2mm), 3D fibre reinforced mouldings based on the company’s proprietary DFT (dispersed fibre technology), using a combination of injection, compression, transfer and flashless fabrication techniques. For more information on Metflex and MetflexSubsea call +44 (0)1254 884171, email sales@metflex.co.uk and visit the web site www.metflex.co.uk.